Gawker is filing for bankruptcy. Peter Thiel, who is a Facebook board member and Donald Trump delegate, secretly sued Gawker in a proxy lawsuit and, even though the case is unresolved, it was enough to bleed and bankrupt the company. And so much of the Silicon Valley establishment cheered Thiel on. Can we pause for a moment? This isn’t abstract anymore, the Chapter 11 paperwork has been filed. Can we talk about how strange it is for a group of Silicon Valley startup mentors to embrace secret proxy litigation as a business tactic? To suddenly get sanctimonious about what is published on the internet and called News? To shame another internet company for not following ‘the norms’ of a legacy industry? The hypocrisy is mind bending. The motto of the valley is Fail fast. Disrupt. Make something people want. All of these are things that Gawker, Gizmodo, Kotaku, Jezebel, Deadspin, Jalopnik and Lifehacker have done. Each of these sites and communities has grown and evolved in the past 10 years. They have run tens of thousands of stories, broken huge news, pioneered a sustainable ad model (without any VC cash), admitted mistakes, and deeply influenced the way you deliver truth to power online. Gawker alumni are now editors at nearly every prestige media outlet in NYC. It’s fine to disagree with Gawker. They certainly have screwed up sometimes, but there’s a reason we made freedom of the press, the first amendment. Why can’t Silicon Valley counter speech with speech? Why do you need to use a proxy lawsuit? Many legal experts predict that Gawker will win the Hulk Hogan case on appeal but it won’t even matter because fighting the lawsuit took so much money that it bankrupted the company. This is Silicon Valley justice? My worry, as someone who works in tech, is that support of Thiel is going to backfire and everyone in tech will suffer. The world is waking up to the hypocrisy and grotesque wealth of the valley — they want to know who this new power is and they won’t always be nice in their questioning. The middle class in America, the European Union, and those abroad want to know what kind of future it faces as the tech industry continues creating products that eliminate their jobs. Thiel just crucified the most notorious dissenter of Silicon Valley and called it ‘philanthropy.’ If this is how Silicon Valley billionaires are going to treat their dissenters, then dissenters have no choice but to go underground. With a single wire deposit, Thiel has made a tabloid that covers Silicon Valley untenable as a business. What media entrepreneur can afford to regularly take on Thiel’s lawsuits? But in that same stroke, he has validated the concerns of many dissenters and blessed new rules of engagement with the Silicon Valley establishment. Secrecy? Proxy lawsuits? Fraudulent client solicitation? All of those are on the table now. If Thiel is successful in destroying Gawker, he will martyrize them. The Hollywood movie that will come from this a few years from now is amazing to imagine. Social Network — The Sequel. Staring Jesse Eisenberg, Hulk Hogan, Donald Trump, and a series of tech billionaires with egos as thin as egg shells. I now feel hesitant to bring up a point like this in a public forum. So many of those I know in the heart of SV are thoughtful, deeply intelligent, interesting people but this is their blind spot. They have funded or built massive new institutions of social change without much scrutiny but the scrutiny is finally coming and they don’t know how to handle it. They will cut you out or block you for even engaging. Paul Graham and a partner at Andreessen Horowitz unfollowed after I made a few tweets in support of Gawker. A single email from any of these guys could torpedo my next round of funding. I have more to lose than to gain by putting my name next to this. This is the situation Peter Thiel puts the tech industry in when he bleeds an independent press willing to put a byline and a banner ad next to their story. This is Thiel using his fortune as a Trump Card. And just like the @realDonaldTrump, suing or blacklisting doesn’t shutdown dissent, it transforms it into something that is more suspicious, conspiracy prone, and chaotic. It could all be too late for this, Über Gawker could already be on its way but there are ways to mitigate the damage and there is still time to change the narrative. Call off your lawsuit Peter Thiel. Take Jeff Bezos’s advice and get a thicker skin. Accept that yes, even you can make embarrassing business decisions — the six billion you blew at Clarion Capital for your hedge fund idea probably isn’t ever going to come back. But you’re still a billionaire and you’ve done some amazing things. Zero to One was one of the most hard hitting, gimlet eyed books about startups I’ve ever read. You’ve built incredible companies. Don’t let your legacy get defined by this. You have more interesting stuff to do. Kara Swisher invited Nick Denton and Peter Thiel (or any of his high profile critics) to record, Nick was the only one to show up. At the very least, if you are going to make these moves, have the guts to do the single thing that Nick Denton asked of you. Meet him in public. If you’re so convinced that Facebook is pure and Gawker is ‘Al Qaeda’, then why are you afraid to simply have a conversation about this in a room with an audience? 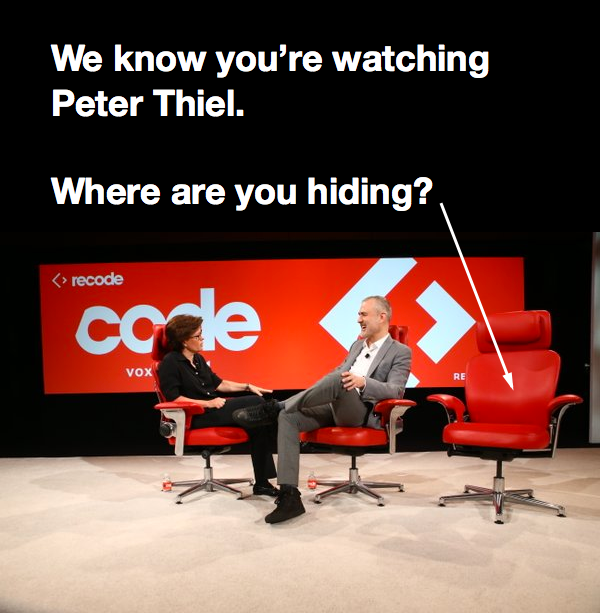 You were invited to Recode to sit next to Denton and make your case, the empty chair says so much about what you really believe. And Mark Zuckerberg. You’ve talked, at length, about Facebook’s support of the independent press and now we have a test that goes beyond a slogan. One of your board members just bankrupted an independent blog that was often highly critical of Facebook. And he’s not stopping. Just yesterday, Thiel’s lawyer threatened a new multimillion dollar lawsuit against Gawker for writing a negative piece about Donald Trump. Who, as you know, is also the candidate Peter Thiel is supporting and representing as a delegate. When does this stop? Facebook is one of the most influential companies in the world, even if all of this is legal, is this ethical? Is this the kind of behavior that we can expect from the Facebook board? Mark Zuckerberg has yet to really comment on Thiel. This is one of those moments where we will learn what Facebook means when it says it’s mission is to give people the power to share and make the world more connected. UPDATE: Mark Zuckerberg has voted to keep Peter Thiel on the Facebook board and he has yet to deliver a single quote addressing Peter Thiel’s secret lawsuit against Gawker.